My career was derailed after I decided to stand up for patient safety. Then to prevent my whistleblowing case being heard, all junior doctors were argued out of whistleblowing protection. We have won whistleblowing protection back for junior doctors and dentists. I am Dr Chris Day. 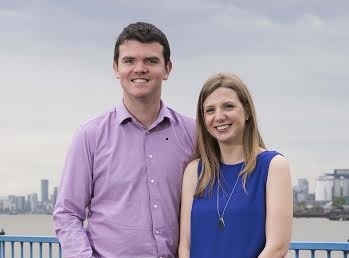 I have a family with two young children and was a junior doctor on a path to becoming a hospital consultant. My career was derailed after I decided to stand up for patient safety in the hospital where I was working. In order to prevent me having a whistleblowing case heard by an employment tribunal, a Government body called Health Education England attempted to argue junior doctors out of statutory whistleblowing protection. 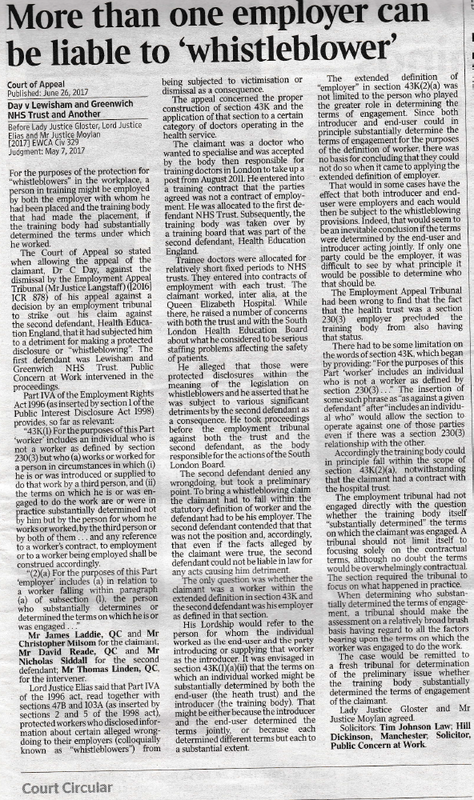 We recently defeated these arguments in the Court of Appeal after a two year battle and my case has been sent back to the London South Employment Tribunal. This victory would not have been possible without out our 4,000 plus supporters on CrowdJustice and our excellent legal team. Following our success in the Court of Appeal, I am now going back to the Employment Tribunal and bringing my whistleblowing case against Health Education England and Lewisham and Greenwich NHS Trust. I am claiming that instead of dealing with patient safety issues, Health Education England and Lewisham and Greenwich NHS Trust attempted to discredit me. I raised concerns about patient safety when working as a doctor at the Queen Elizabeth Hospital in South London. The safety issues involved serious understaffing in one of the Trust’s Intensive Care Units where I was working. It has been established since that my concerns were well-founded and the NHS Trust has claimed that they have taken action to deal with the issues that I first brought to the attention of both the Trust and HEE in 2013. At night, the unit I worked at departed significantly from the staffing levels that national standards say are safe for patients. My claim is that Health Education England and Lewisham and Greenwich NHS Trust attempted to discredit me and deny the significance of the understaffing rather than deal with the issues and acknowledge that patients were at risk. Despite the stance the NHS took against me at the time, the NHS Trust stated publicly much later that it had identified the need to increase medical staffing numbers for the Intensive Care Unit where I had been working, and that the unit was now fully compliant with quality standards. I would like to make clear that my dispute is with senior managers at the Trust and HEE and not with clinical staff at the hospital or my 2 consultant clinical supervisors with whom I felt I had good relationships and from whom I received excellent supervisor reports. Nonetheless, as a result of the way the NHS dealt with this I have lost my career, been removed from my career path to consultant and suffered a number of other significant detriments. 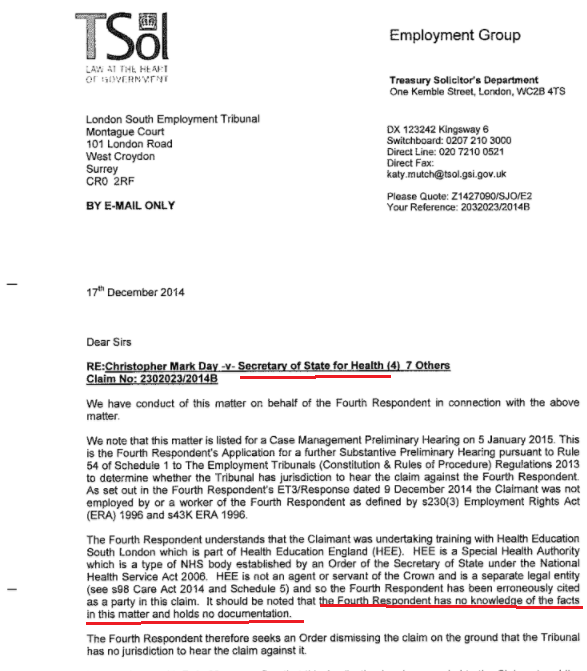 In addition, Health Education England (HEE) tried to block my whistleblowing case being heard. It argued wrongly, as events have proved, that my case shouldn’t be heard by an employment tribunal. It said I was not entitled to bring a claim against it. It claimed that no junior doctor is allowed to bring a claim against HEE under whistleblowing law. It said, wrongly, that this had been Parliament’s conscious choice. 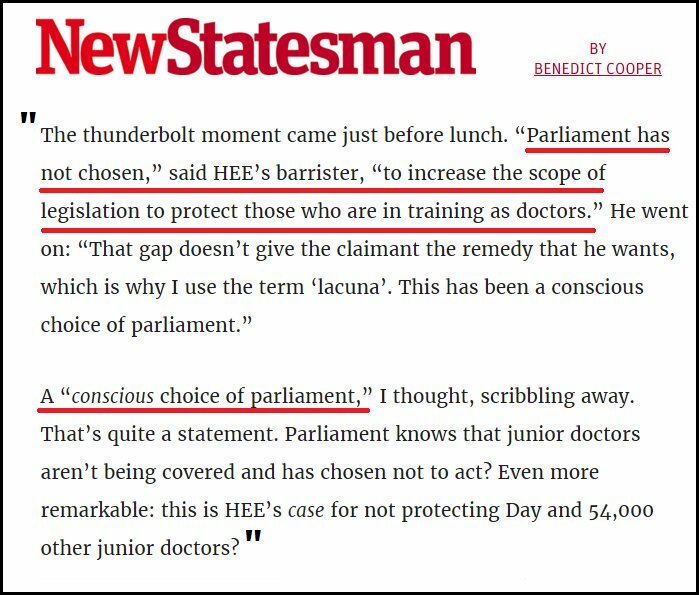 HEE claimed, wrongly, that Parliament had intended to exclude junior doctors' careers with HEE from statutory whistleblowing protection. HEE are the only NHS body with the power to recruit or terminate a junior doctor's career. The NHS Trust argued that it was not responsible for the actions of HEE and had no responsibility for my long term employment. This has resulted in the serious issues my case raises being buried for over two years. It is completely wrong that HEE should avoid being accountable for the detriments they have subjected me to. 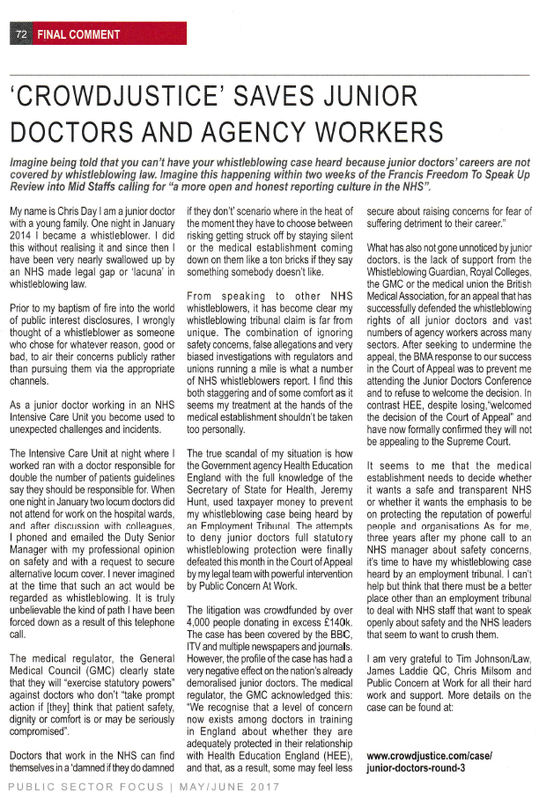 I cannot describe what it was like in February 2015, as a junior doctor to attend the Employment Tribunal and be told that I can’t have my whistleblowing case heard because junior doctors’ careers are not covered by whistleblowing law - especially so soon after the publication of the Francis Report on Freedom to Speak Up Review into Mid-Staffs. In the end, after two years of struggle, justice was done when on 5 May 2017 the Court of Appeal upheld my appeal and quashed HEE’s legal arguments regarding junior doctors not having statutory whistleblowing protection. Lord Justice Elias and the other Court of Appeal Judges have ordered HEE back to the London South Employment Tribunal so that my whistleblowing case against it can be continued there. The Court of Appeal judgment has given us the chance to go back to the ET and establish that junior doctors can bring a whistleblowing case against HEE. It also clarifies the law for the HEE equivalents in the devolved nations as well as assisting many agency workers in many different industries. Our ruling clarifies that they too can claim whistleblowing protection against their agency or end user including junior doctors with host Trusts in lead employer relationships. Court of Appeal Judgment can be found here. The case has been widely covered in the media – in the Mail on Sunday, Independent, New Statesman, British Medical Journal, Health Service Journal, Canary, ITV News and on BBC Radio 4 among others. Public Concern At Work asked me to write a blog about my experiences. "Damned if you do, damned if you don't." The Court of Appeal has ordered that there be a Preliminary Hearing to hear evidence on the influence HEE has over a junior doctor’s engagement as a specialist or GP trainee. This will include examining any influence HEE had over introducing the new junior doctor contract. I will succeed at the Preliminary Hearing if the tribunal finds that HEE substantially determines the terms on which junior doctors are engaged. That will enable my own personal whistleblowing case against HEE to get going again and finally get a full hearing before an employment tribunal. Getting this far has been at a huge personal cost to me and my family. I am very grateful to all those who supported me over the last two and half years and especially to my 4000 plus CrowdJustice backers. Public Concern at Work was also particularly important to winning in the Court of Appeal and the evidence they provided to the Court of Appeal can be found here. 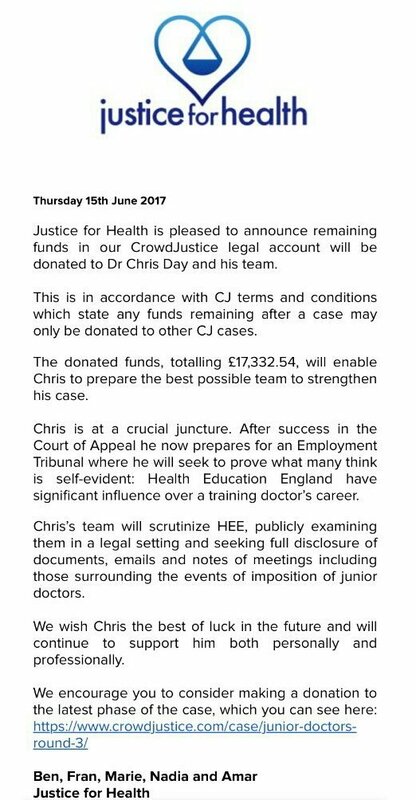 I now need to raise further money to pay for the Preliminary Hearing to establish that junior doctors are covered by whistleblowing law and for my own tribunal case after that. Rather than defending itself against my allegations, Health Education England chose to spend public money undermining whistleblowing law, not only for junior doctors but for agency workers in general, just in order to prevent my whistleblowing case against it being heard. My case is also about how the NHS deals with whistleblowers. My case is based on patient safety issues in Intensive Care. Intensive Care is where the sickest patients in the hospital go when they need special, intensive support to keep them alive. My whistleblowing claim is that HEE and Lewisham and Greenwich NHS Trust made false allegations and used unfair investigations to discredit me and what I was saying about staffing and safety so that they didn’t have to deal with the actual problem. My case highlights what is wrong with the culture in the NHS. It is exemplified by trying to discredit a junior doctor when they raise an issue about patient safety. In my case it has destroyed my career. However, hopefully things are changing and the public are becoming increasingly aware how important it is to expose this culture where it occurs in the NHS, to hold those responsible to account, and to stamp it out. My case has had an enormous amount of publicity. I hope that, among other things, it plays a part in hastening this process. My trade union, the BMA, initially supported my case and their law firm, Gateley, were preparing proceedings against the Trust and Deanery/HEE. The BMA insisted that the NHS and HEE carry out formal investigations. 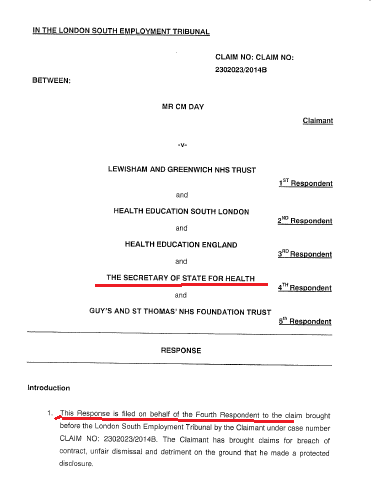 Suddenly, five working days before the claim had to be submitted and before the delayed Trust and Deanery formal investigations had reported, the BMA withdrew all legal help from my case . Around the same time my BMA Senior Industrial Relations Officer went on “special leave”. I have since learned that he was dismissed for gross misconduct and the record he prepared of a crucial meeting apparently no longer exists. 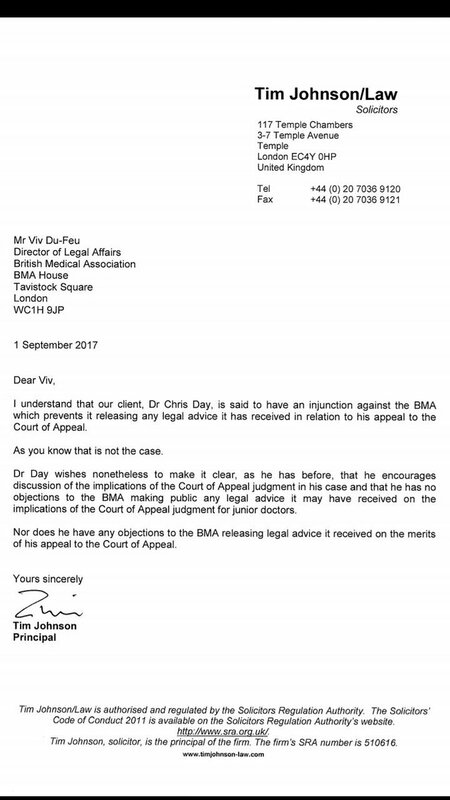 The Legal Ombudsman made several criticisms of Gateley but stated that they did not have the power to investigate any action of the BMA and in particular the circumstances in which my BMA rep was removed from my case and the BMA. I have been overwhelmed by the generosity people have shown me. My supporters on CrowdJustice have enabled me and my team to do things that I never thought would be possible. The £140k donated so far has funded the legal work which was needed to get all the way to the Court of Appeal. I should add that I couldn’t have got as far as this without absolutely brilliant work by my lawyers, James Laddie QC, Chris Milsom, and Tim Johnson and Tess Callaway of Tim Johnson/Law. They have agreed to go on representing me. I now need to raise a further £100,000 to fund the work for the Preliminary Hearing and what my lawyers expect to be at least a 10 day employment tribunal hearing against two separate teams of NHS funded lawyers. A public hearing will serve doctors and patients as it will bring the facts of this case out in the open as well as the actions of other bodies I have reached out to for assistance, including the doctors’ union, the BMA, and the medical regulator, the GMC. As the last two years have shown, whistleblowing law is hard to use and I am lucky to have the backup of lawyers at the top of their game which is so often not the case with whistleblowing cases. I am so grateful to my supporters for enabling me to be able to fight this case. The country needs people like you to save the NHS. It is sinking in what we have all achieved together. We could not have done this without our amazing legal team and our generous backers on Crowdjustice who have given far more than just money to enable this victory - they have walked with us down what can often be a lonely road. Our Press Release and the Court papers can be viewed here. I am off to meet Jeremy Hunt next week and I will keep you posted on how that goes. Our 14-17 May hearing at the London South Employment Tribunal is approaching. We could not have done without you. Yesterday, Sir Robert Francis QC, who led the 2013 inquiry into the scandal at Mid Staffordshire criticised the HEE position in my case and their decision to spend vast sums trying to prevent my whistleblowing case being heard rather than dealing with the important safety and misconduct allegations that the case raises. The full BMJ Article can be read here..
“Francis also questioned the legal process in the case of Chris Day, a junior doctor who claimed that Health Education England treated him unfairly after he spoke out about unsafe staffing levels. Francis said that HEE’s defence of the case was at odds with its decision in 2016 to introduce whistleblowing protection for junior doctors as part of their contracts. Last weekend I spoke at a BAPIO Conference on my whistleblowing case and how whistleblowing law has been undermined for many other workers trying to prevent my case being heard. The Rt Hon Norman Lamb MP writes a letter to the Rt Hon Jeremy Hunt to invite him to a meeting with me and my lawyer. The Rt Hon Norman Lamb MP writes a letter to the Rt Hon Jeremy Hunt to invite him to a meeting with me and my lawyer. Read the letter here. At a similar time I wrote a letter about my case to several Labour MPs that have made public statements about it. The letter can be read here. Justin Madders of the Shadow Health team has tweeted that they are considering what action to take. This Daily Mirror article gets to the heart of what the attempt funded by the taxpayer to argue junior doctors out of whistleblowing protection was really about. 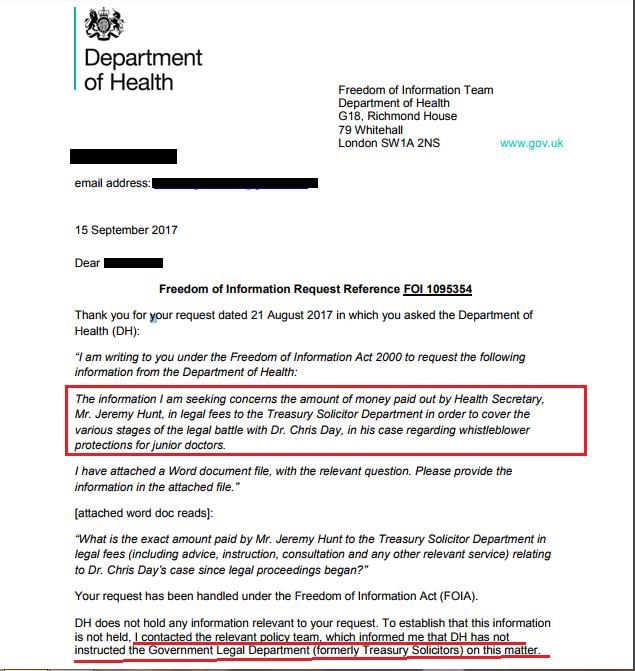 Mr Hunt, Secretary of State for Health was asked by a journalist about his instruction in the case of Government solicitors, the Treasury Solicitor. The Department of Health then denied to another journalist that they had been instructed in the case. Below is a shot of Mr Hunt's papers from the Treasury Solicitor that should remove all doubt. Senior GP, Dr Bob Gill has made this video exploring why there is a need for crowdfunding in order to defend statutory whistleblowing protection for all junior doctors. Dr Gill also explores how and why the medical union the BMA have tried to obstruct the process and continue to despite our victory in the Court of Appeal and the clarity of the judgment. Dr Gill’s video can be watched on You Tube or on our CrowdJustice case page. In preparation for the 13 September BMA Council meeting, 9 brave BMA Council members signed a motion asking for the barrister’s opinion that led the BMA to attempt to undermine our successful appeal to the Court of Appeal to be published or sent to my lawyers to enable us to publish it. We believe our generous crowdfunders and the medical profession have a right to this information. The BMA have refused to confirm that the motion even made it to a vote. 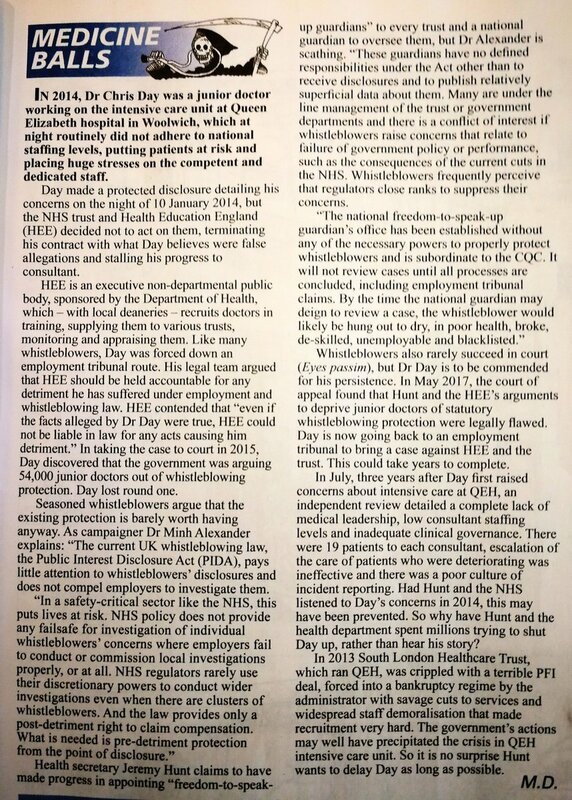 Private Eye ""So it is no surprise Hunt wants to delay Day as long as possible"
We are grateful to Dr Phil Hammond for featuring the case again in Private Eye and to the HCSA union for their clear article on our Court of Appeal victory. 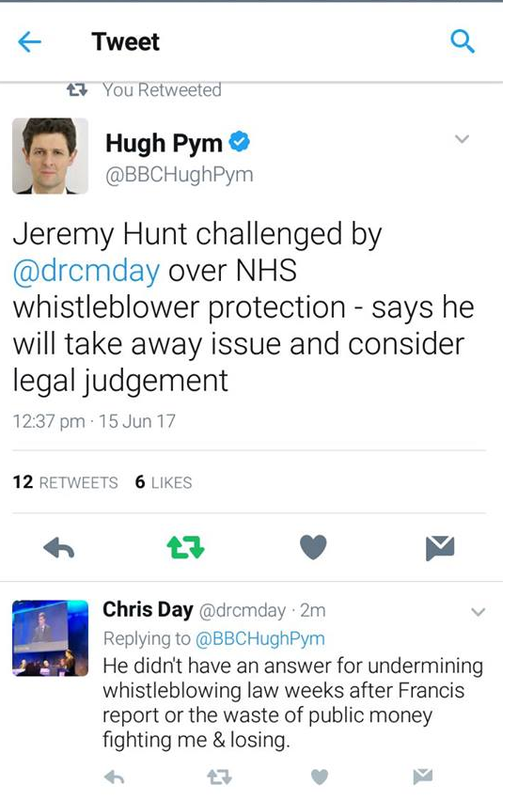 "So it is no surprise Hunt wants to delay Day as long as possible"
To view article on Twitter click here. Private Eye are not the only ones speaking out about the case. The medical union, the BMA have been undermining the case for several years but some within the BMA are beginning to challenge their actions. Dr James Haddock, a Deputy on the Junior Doctors Council has written a blog speaking out about the case. Professor Pollock of BMA Council has also made her views known publicly and is now under investigation by the BMA which is explored here. We have also sent this legal letter into the BMA in support of open debate about the Court of Appeal process affecting all junior doctors. Over the last few years there has been much debate about the legal arguments advanced to undermine whistleblowing law for doctors and to prevent my whistleblowing case being heard. Last week the focus turned to the Intensive Care Unit at the centre of the whistleblowing case in an article published by the Health Service Journal. It was swiftly followed up by a comment piece from a former senior doctor at Lewisham and Greenwich NHS Trust which provided some very useful information. Click here to view the article. A picture emerges of NHS services in the London Boroughs of Greenwich and Bexley being underfunded and destabilised as a result of two of the worst negotiated Private Finance Initiatives deals in the country which presents a likely underlying cause for the safety and resourcing issues at the centre of my case. 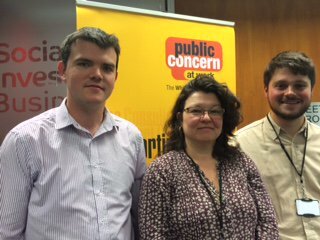 We are immensely grateful to the whistleblowing charity Public Concern at Work and their lawyers Anna Birtwistle of CM Murray LLP and Thomas Linden QC for intervening in the Court of Appeal with my lawyers Tess Callaway, Tim Johnson of Tim Johnson/Law, Chris Milsom and James Laddie QC. Anna Birtwistle has produced a helpful blog and video to explain the significance of our victory in the Court of Appeal. I asked Mr Hunt about all of this at the NHS Confederation Conference at 1h 45 minutes 21 seconds in the below video. Our next Employment Tribunal Hearings have been listed for May 2018 and September 2018 which is a long wait given the public interest associated with the events in the case that date back to 2013. HEE have also asked for the case to be listed for 24 days in total which is hard to see as anything other than attempt to drain my resources. The Intensive Care Unit that was at the centre of my whistleblowing in 2013-14 has recently been peer reviewed by the South London Critical Care Operational Delivery Network. Its report into the ICU at Queen Elizabeth Hospital, Woolwich, raises similar concerns to those raised by me three years before. It finds that there are long standing cultural issues and that doctor/patient ratios are a matter of serious concern. The Peer Review report introduces the context that the Queen Elizabeth Hospital has found itself in following the reorganisation of local services by the Secretary of State for Health and a Private Finance Initiative deal. “In April 2009, the hospital was part of a merger with Queen Mary's Sidcup NHS Trust and Bromley Hospitals NHS Trust to form South London Healthcare NHS Trust. In July 2012, Andrew Lansley, Secretary of State for Health, announced that the South London Healthcare Trust, formed in 2009 was to go into special measures due its financial difficulties. On 1 October 2013, QEH merged with Lewisham announced Healthcare NHS Trust to form Lewisham and Greenwich NHS Trust in the confidence that the new Trust will be better able to meet the challenges as part of a larger organization." At the NHS Confederation I was allowed to ask the Secretary of State for Health, Jeremy Hunt about why he and HEE decided to argue junior doctors and agency/contractor workers out of statutory whistleblowing protection? This NHS Confederation video captures my question and Mr Hunt’s response. He does not deny the allegations put to him. I sent this letter to Mr Hunt on 10 January 2016 but received no response. We are very grateful for the generosity and friendship shown to us by Justice for Health. The donation will be hugely helpful in progressing the case.